Without any doubts, this apartment is one of our best designed. Great effort was put to make the apartment stand out. Every feature was carefully chosen to compliment the historic architecture such as the remains of the wall which can be still seen in the apartment. Fully equipped kitchen, spacious living room, bathroom with walk-in shower and one bedroom with comfortable double bed and the luxury bedding are absolutely top notch in their quality. We focused also on every single detail of the apartment, such as designer's wall lights, chandeliers and marble elements. Krizovnicka apartment is situated a minute from river bank and across the street from Four Seasons Hotel. The location is a perfect base for sightseeing and discovering Prague. Please note that check-in takes place at the following address: Karolíny Světlé 4, Praha 1, the office is open 24/7. Children under 2 years stay free of charge. Children at the age of 2-12 years stay for a charge of 10 EUR per night. Please, do not include them in the number of guests in your reservation, just announce that they are travelling with you. You will pay for their stay during your check-in. Hello, glad to see that you are interested in our beautiful city, Prague! My name is Klara, I’m 25 years old and I live in Prague - magical Central European city. I love nature and great food (preferably Asian and Italian cuisine). I have recently fallen for jogging – it boosts me with energy and perfectly prepares for a new day. I also love adrenaline experiences in general - camping, all kinds of sports (skiing, squash or badminton) or even rafting. I work with a group of young enthusiastic people (mostly students) and together we are renting a number of apartments in the centre of Prague here on Airbnb. I have a lot of experience with tourism, since I work in hospitality industry for a fifth year now. That’s why I can recommend a lot of great and interesting cafés, restaurants and secret places only the locals know. It's my passion (and also the passion of my team) to get to know new people, new cultures and experience something interesting every day. For that reason I love Airbnb that much - it made possible that my passion is now my everyday reality. With a help of my team, I am really doing my best to make every stay of our guests an unforgettable experience. Feel free to ask me anything, I am available 24/7. Hope to see you soon in Prague! TOP quality apartments, service and assistance in the very center of Prague. The bathroom is fitted with toilet, sink, bath, mirror, hair dryer and a washing machine. All standard toiletries and towels are included and replenished in the price. Whether you want to prepare a quick cup of coffee or a full gourmet meal, our superbly appointed kitchen contains everything you require. Just like home. - 24/7 assistance / front desk services - discounted airport / train station transfers - contact us for the conditions - our concierge service includes other features - tours and excursions, theatre ticket reservations, shopping delivery service, baby sitting, private chef etc. The apartment was just perfect, very well located, and all renovated looking like a brand new apartment in the middle of the old town. Thank you for taking your time for the review. We are happy that you enjoyed your stay and we are looking forward to having you again as a guest in our apartment. We really appreciate it and hope to see you soon, take care! Great apartment beside the Charles bridge. Wonderful city. Very helpful owners who arranged to collect us from train station on arrival and drop is to airport on departure. This apartment was absolutely gorgeous and spotlessly clean, however we did experience some problems. We couldn’t get in the apartment and Prague City Apartments had to come and let us in! We also had a backed up drain in the shower that kept flooding the bathroom, and the day we left there was no hot water. So why did I give this a five star review? The problems were handled immediately by the management company! 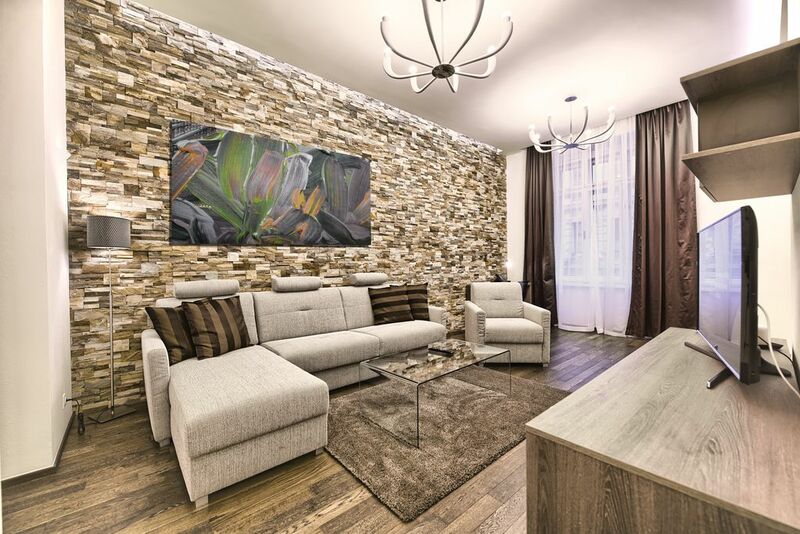 I think these are things that could have happened to anyone, but we were so pleased with how it was handled that we wouldn’t hesitate to rent this apartment or any other from Prague City Apartments. Thank you so much for your review and kind words. I am glad the issues didn't ruin your overall experience and that you have liked the apartment and the location or our services. We are very sorry for the occurred issues. Because of the extreme business each summer it is challenging to avoid all technical and operational problems but we are constantly working on progressing our services and I am sure we will be able to avoid the maximum of potential issues next time. Thank you again and don't hesitate to spread the message among your friends and family! Perfect location! Modern immentities and top-notch service! We absolutely loved this unit. We originally booked a 1-bedroom, but due to some schedule changes, the hose graciously set us up in the same building in a 2-bedroom. Everything from the decor to the bathroom to the location was perfect. Check-in was a breeze as well. This location is a 5 min walk to the Charles Bridge and 10 min or less walk from Old Town center. Small market store right below, which we used often for snacks, drinks, breakfast, etc. It is on a busy street, but the bedrooms are towards the back courtyard so even without A/C and having all the windows open and being on a tram line and busy street, we had no issue. Only issue we had the whole time was the amazing steam shower drain. The shower was the best I have ever had in any Homeaway/AirBnB ever and probably the best in anywhere I have stayed in Europe. Just the drain was very slow, so water built up. Loved it! Great location, spacious, clean and modern apartment. Everything you could want in a vacation rental. Esperienza fantastica. Appartamento perfetto in ogni dettaglio. Location veramente strategica, nel cuore della città vecchia. Vorrei tornare e vorrei il medesimo appartamento N. 12. Grazie mille per una recensione così bella. Lo apprezzo molto. È stato un piacere ospitarvi Spero che io e il mio team potremo ospitarvi di nuovo nelle vostre altre avventure.